Back in August of 2016. 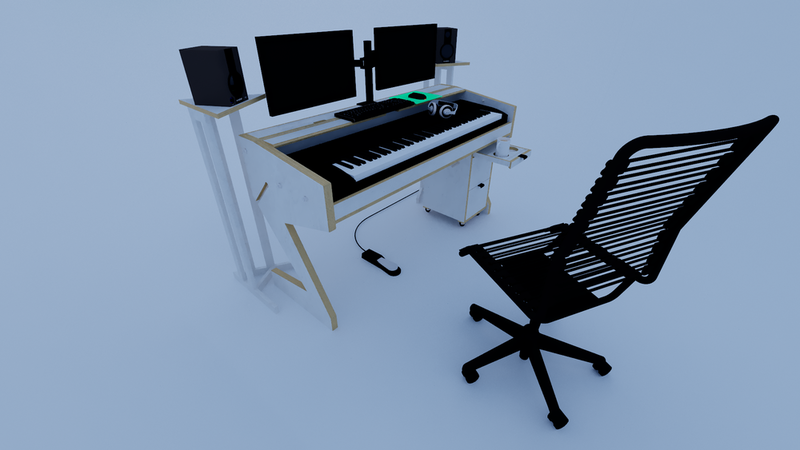 I showed the final design for my own composers desk (and the first few build photos of it). 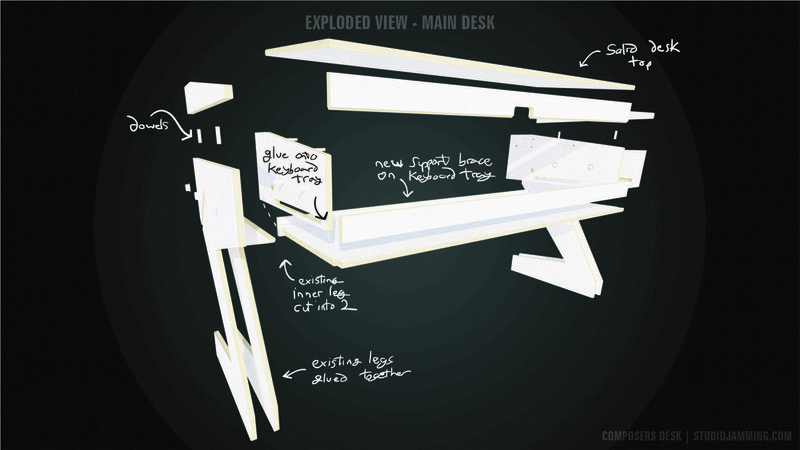 It's now January 2018 and I expect some of you may have wondered what happened to the desk. Well, the answer is... nothing... until now! Please feel free to jump ahead to the section of your choice by clicking on one of the headings to the right. You can also click on any image to expand it into a lightbox. Enjoy! Ever since August 2016, I've only been able to use two of the legs and the base as my workstation - and those are just loosely resting together! Not only that, but my mouse has to be used on the arm of my chair - a space barely wider than it! The truth is, a combination of being too busy with projects, and lacking some necessary tools (a specific router bit) meant no more progress was made on the desk. 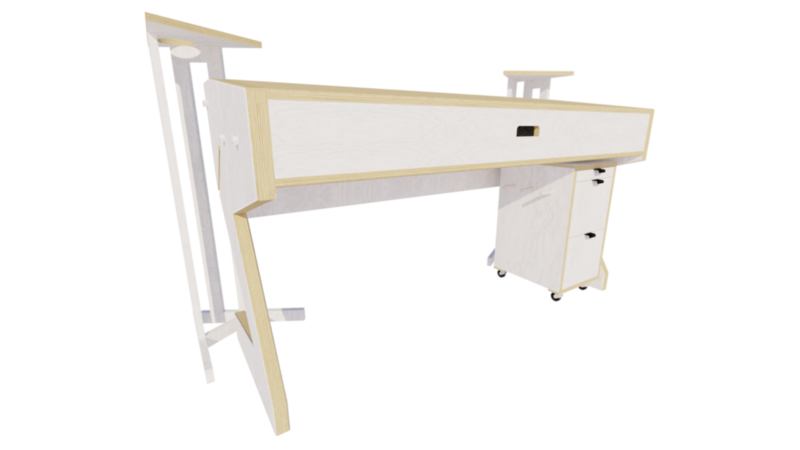 The first thing to do was get rid of the side extensions, and use the existing outer pair of legs to double up the inner ones - bringing the total length of the desk from 2m to just under 1.5m. 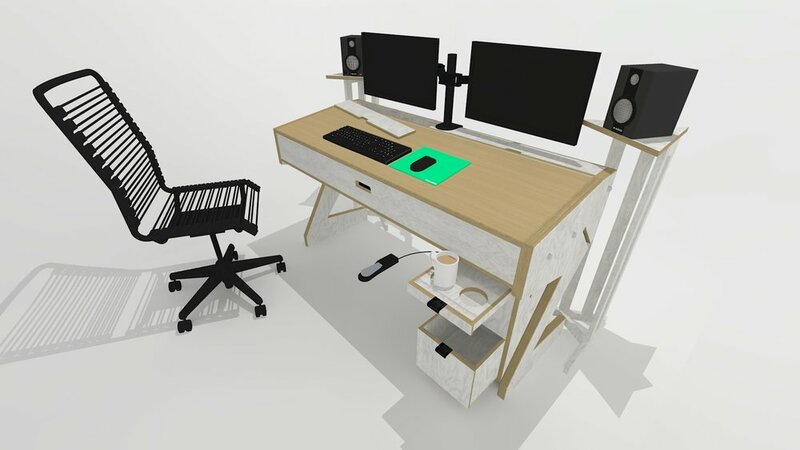 Since I've had this part built desk for over a year, I realised legroom wasn't really an issue as I thought it would be, so to make up for the lost storage, I decided to design a rolling drawer unit that can sit under the desk. This still gives me a whole metre of leg room width. I also wanted to simplify the design a little bit. Instead of routing out the legs in order to have the keyboard lid slide down them, I opted instead to use pegs to guide it between them. This also meant that I could make the lid out of one piece instead of two. I also did away with the hinged storage lids at the back, opting instead to have them just sit in place - not only does this make access easier, but saves on work rebating the lid and side for the hinges. 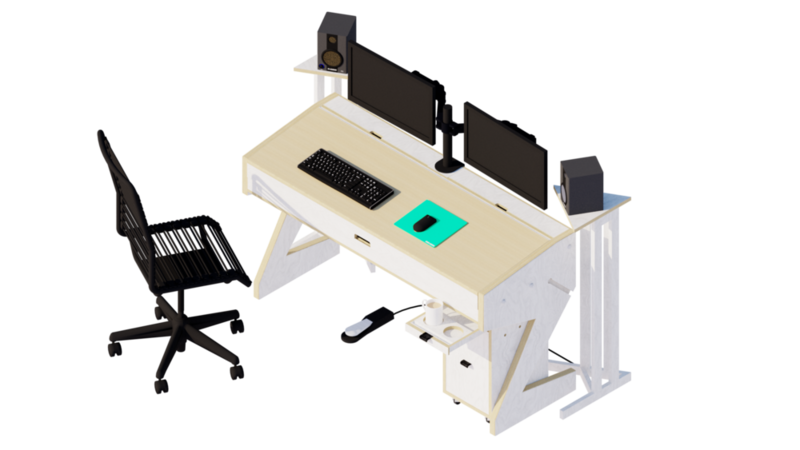 Another key difference with this design is that I wanted the whole thing to be able to be disassembled into a few manageable components. Therefore, the top section of the inner legs will now be seperated and attached permanently to the keyboard tray. 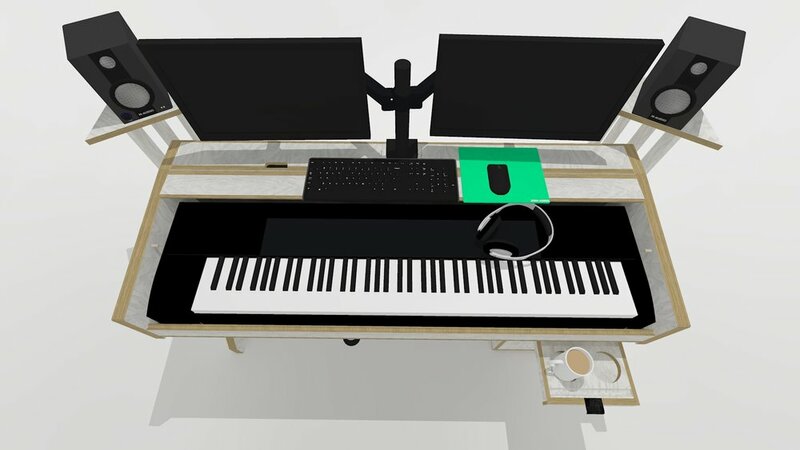 The keyboard tray can then sit on the legs and be bolted in place. 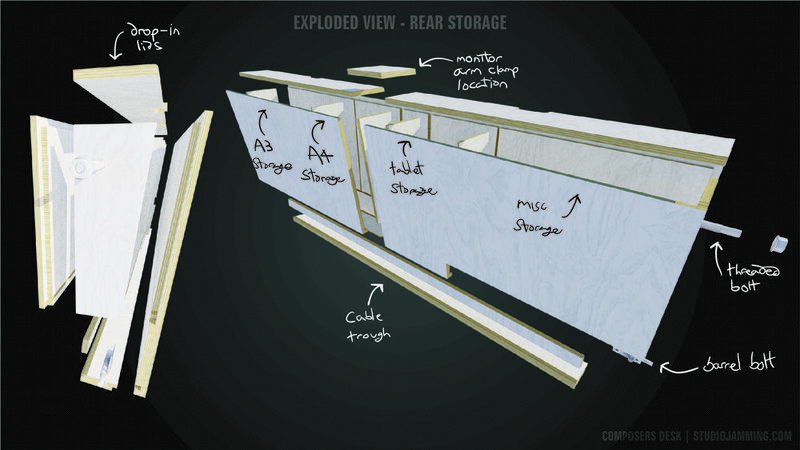 The rear storage section can also now be removed - it attaches at the top via a bolt on each end onto the legs. The bottom is then held in place via two barrel bolts, again securing it to the legs. 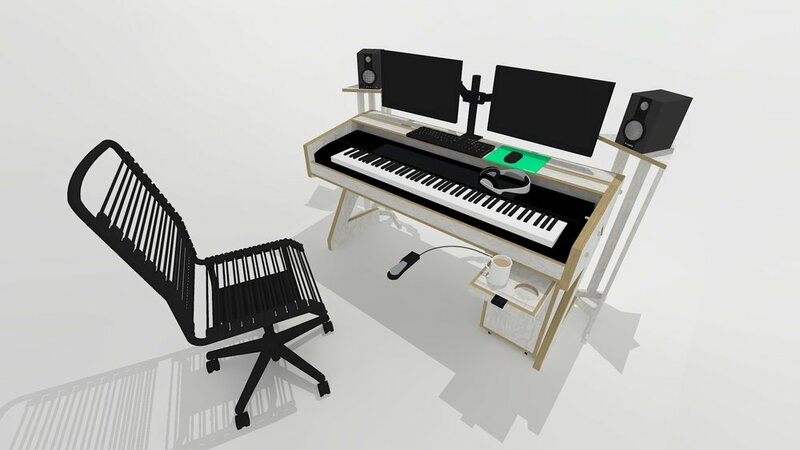 I also took the opportunity of this redesign to add a pair of much needed studio monitor (speakers) stands. This allows them to be sat at the right height, in the right direction, and stops them vibrating the desk. At the moment they are resting on my MIDI keyboard at an unoptimum angle, so I don't use them much. So, let's take a look in more detail! 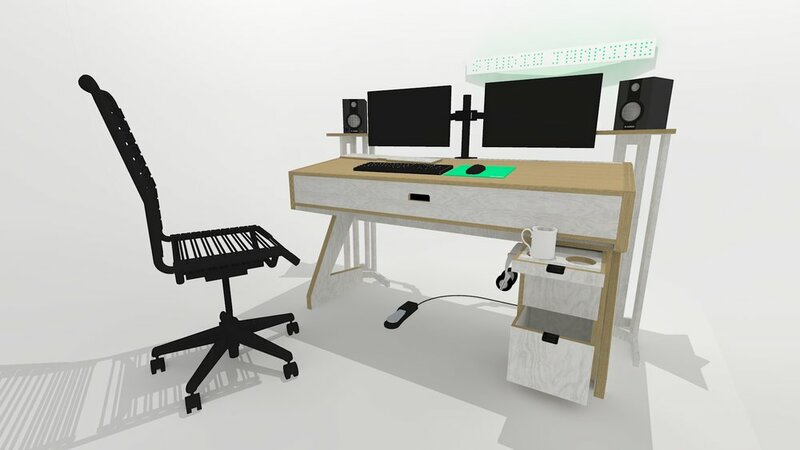 The desk will mostly be made out of various thicknesses of plywood - the visible sides of which will be painted or stained white (I'll have to do some tests before I decide what method). 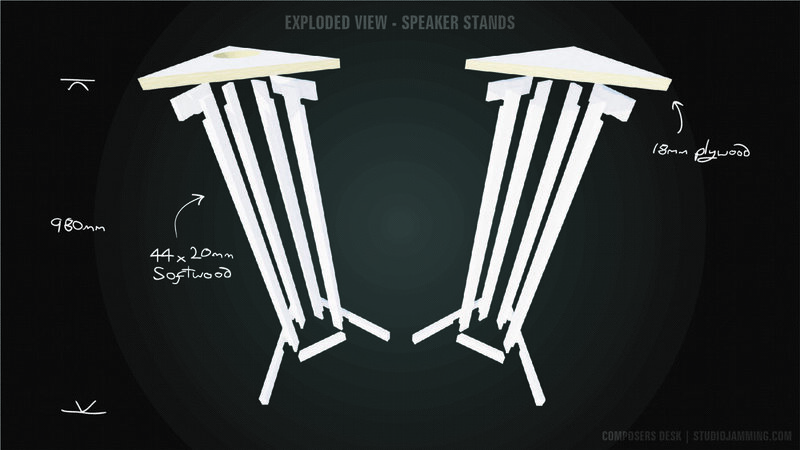 The speaker stands on the other hand will be constructed of 44 x 20mm softwood to keep them lightweight (with the exception of the top which will be 18mm plywood). Almost all joints on this desk will be half-lapped or rebated in some way. Those that aren't will be glued and doweled for strength. Outside edges of the legs will be filleted by 5mm, as will the top and bottom of the front edge of the desk. 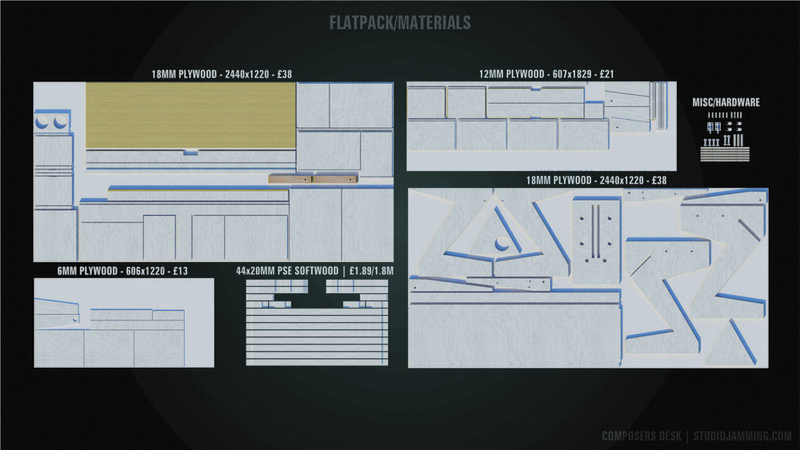 Virtually laying out all the pieces onto standard sizes of board helps give a good idea of the cost and amount of raw materials going into building the desk. It also means you can shuffle it all around until you find the most efficient use of materials before you begin to cut wood. 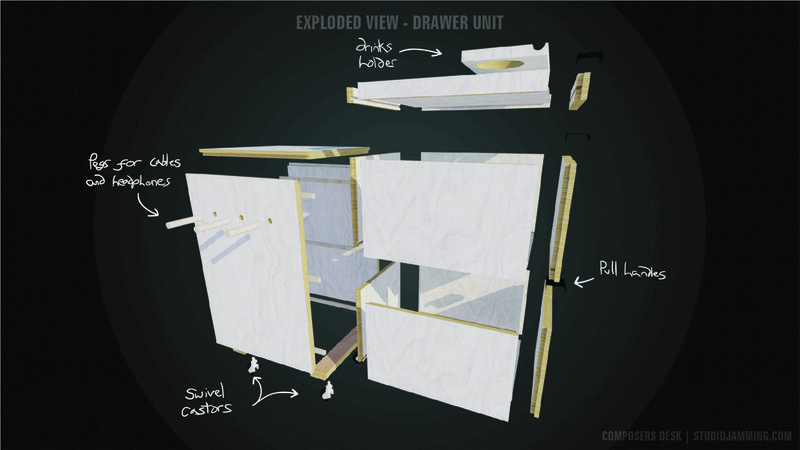 The drawer unit will be made out of 18mm plywood, with each drawer being formed of the following; front - 18mm plywood, sides and back - 12mm plywood, bottom - 6mm plywood. 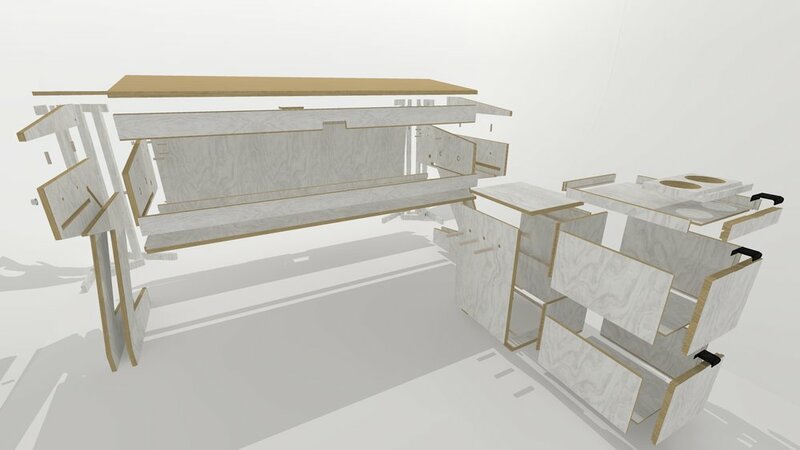 Each drawer will sit on two sections of 9mm square softwood, allowing for a gap of 2mm between each drawer. 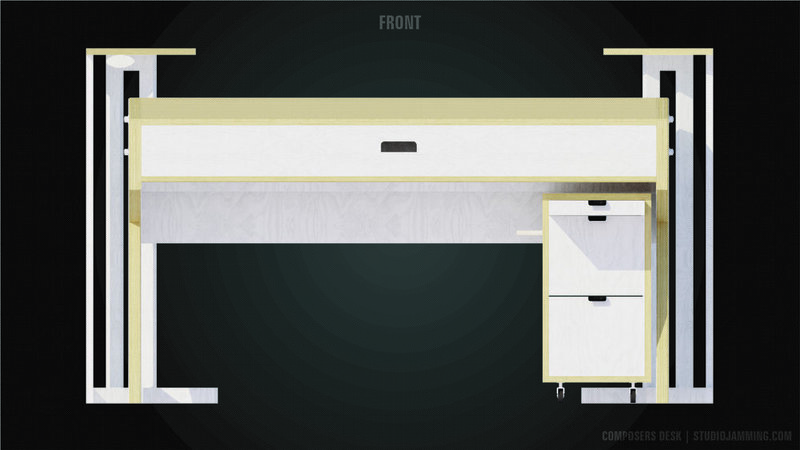 The 6mm plywood base will be rebated into each side of the drawer, making for a strong but thin base. This design still features some useful details that might be missed on first glance. 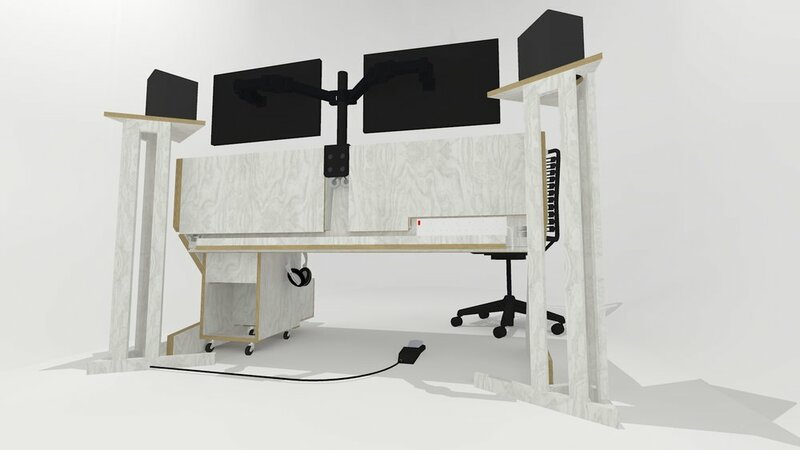 For example, at the back of the desk is space for an extension lead to be affixed, with a cable tray to keep cables out of sight, and out of the way. 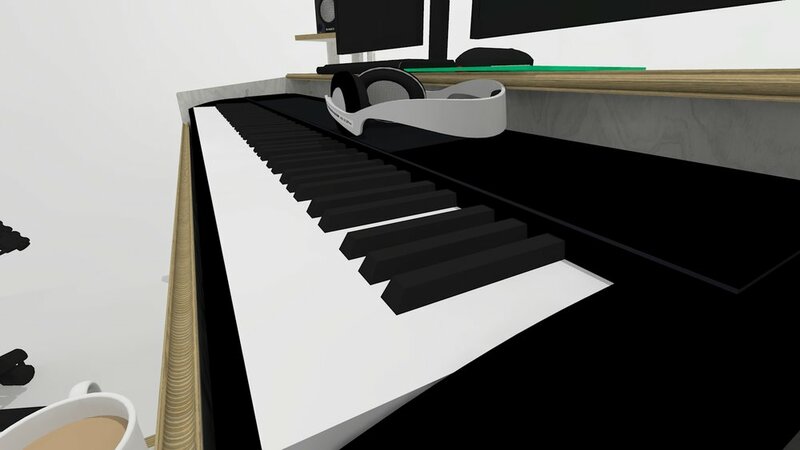 You'll also note the indentation on the ends of the desk leading to a hole - this is used to run cables to the MIDI keyboard without getting them snagged by the lid when it drops down. This rolling unit is a useful accompaniment to the desk. Whilst not a huge storage space, it's plenty big enough for office stationery and items required day-to-day. The top drawer is a surprisingly useful space given how shallow it is. Even at only 18mm deep on the inside, that's enough for those small items that you always manage to lose; pens, pencils, rulers, etc. It'll also be a good place to store AAA or AA batteries and sticky notes. And of course, the drinks holder is always required! The 4 small swivel castors make manoeuvring the unit a breeze, so it can even double as a nightstand or extra small work surface in a pinch. On both sides of the unit, you will find holes to accept pegs for holding awkward items like headphones and cables - for some reason, both of these objects are hard to find homes for. And if I ever needed more space for them, it would be easy to drill holes halfway through the sides and add more pegs! As mentioned earlier, I felt that it was about time I set up my studio monitors (speakers) at the correct height and orientation. In order to do so, you must imagine that you need to form an equilateral triangle between the centre of each speaker and your head. Therefore I've angled both stands at 30 degrees from the back wall. The next step is to align them at the correct height - to do this, the tweeters (top part of the speaker) needs to be at ear level when you're sat down - that's roughly 1200mm from the floor. As the tweeter in this case is 200mm from the bottom of the speaker, the isolating mat sitting under each speaker is 10mm, and giving another 10mm for floor variations, this means the stands must be an overall height of 980mm. With the calculations done, let's turn to the stand design itself. 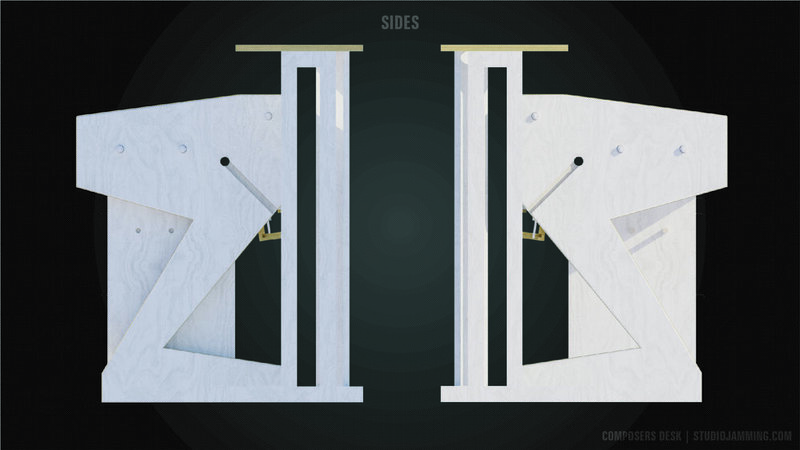 It's a simple and slender structure, made with lightweight materials. 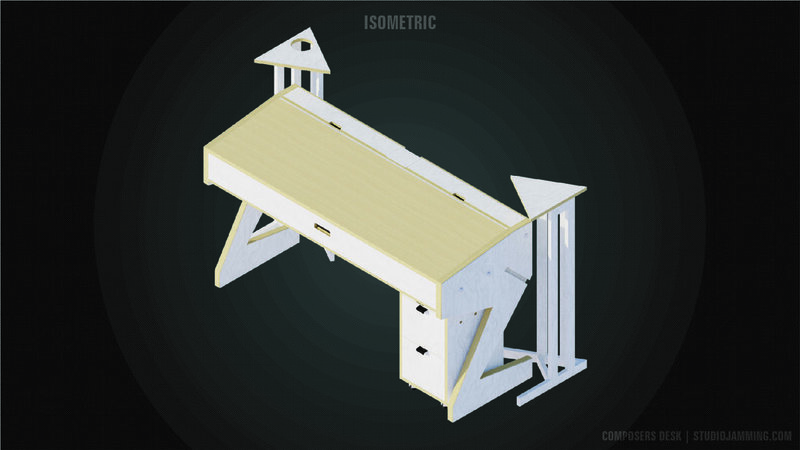 The vast majority of it is constructed out of 44x20mm PSE (planed square-edge) softwood, with all but the bottom cross brace being half-lapped for strength. The 18mm plywood top is then simply glued and dowelled in place. You'll note that the left hand stand has a large hole on the top for feeding cables through (since that is the powered half of the speaker set). The rear storage compartments are very deliberately sized. 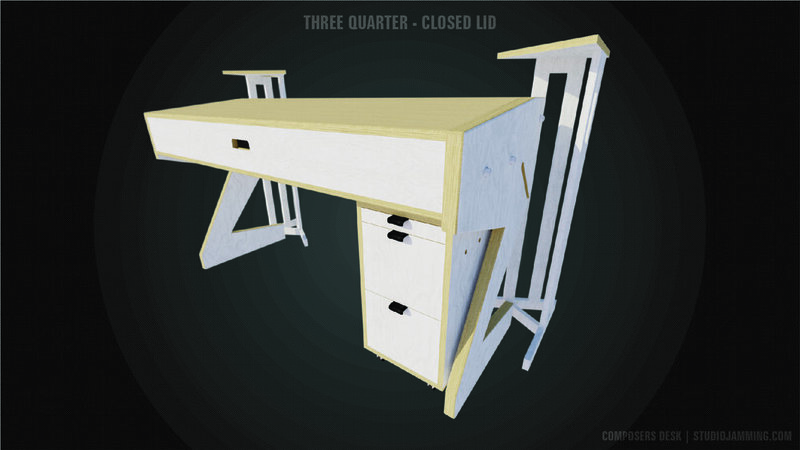 Looking at the desk from the rear (see image below), the leftmost partition exactly holds A3 paper, whilst to its right is a compartment for A4 paper. On the right side of the desk, the left section (same size as A4 paper again) is storage for my drawing tablet - a hole for it's cable can be seen next to the extension lead. The right hand section can be used for whatever else I need - perhaps storage for a few books. 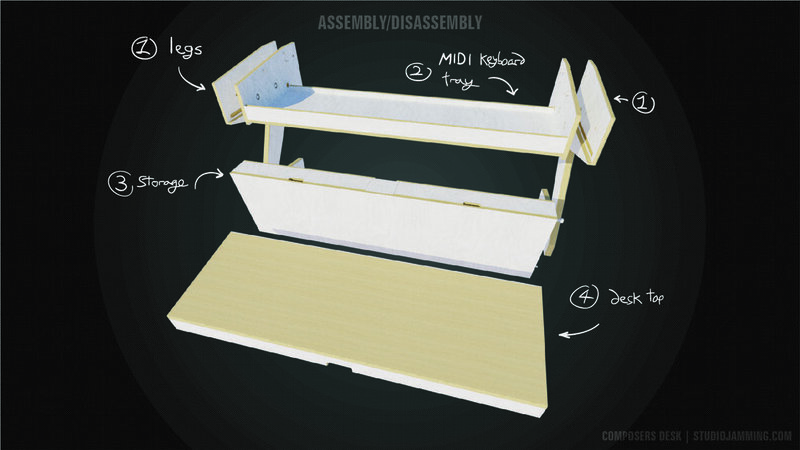 You should be able to make out the amount of rebates needed in this section - each compartment divider and end wall is rebated into both sides, as is the 6mm plywood bottom, cable trough, and monitor arm clamp position block. The lids are also rebated into the sides so that they sit completely flush with the top. That's a lot of rebating needed, and given that one side wall slopes, some are going to be quite tricky cuts! The end result though will be a strong and stable storage section. 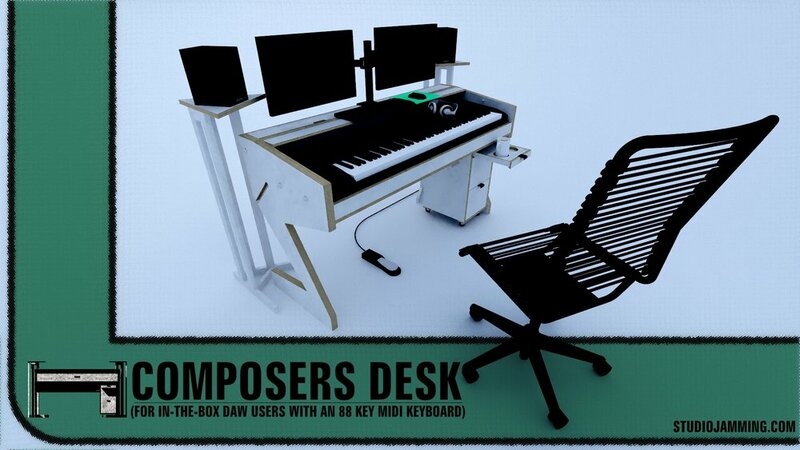 Moving onto the final section of the desk, we have the MIDI keyboard tray - or, the main central section of the desk. As you may well remember, the 4 legs and the tray itself have already been constructed - and are what I'm currently using as I type this. In order to make the whole thing able to be (dis)assembled, and to make the most out of what I already have, I decided the best course of action would be to cut the top off of the inner set of legs and permanently glue it onto the tray. The rest of the legs could then be glued into two pairs which means the tray has something to sit ON rather than IN - which will make assembling it way easier, especially when it comes to bolting it together. It's hard to make out, but I've also decided to add a new support brace onto the back of the keyboard tray. 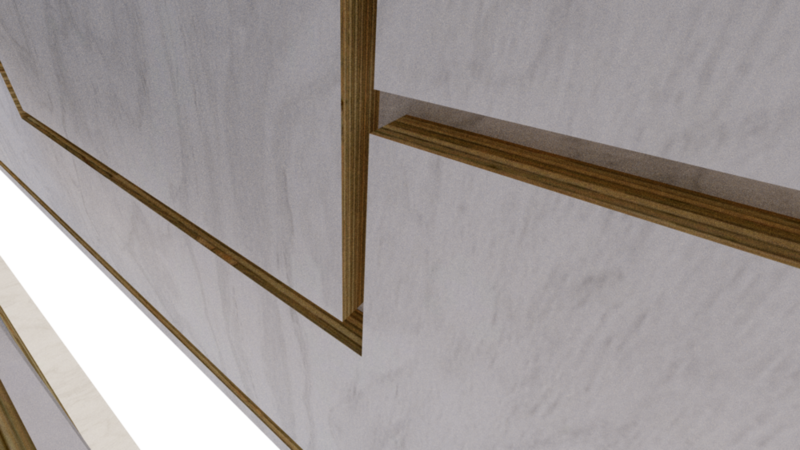 It's basically a U shape of rebated 18mm plywood that sits over the top and bottom - helping to keep it level. 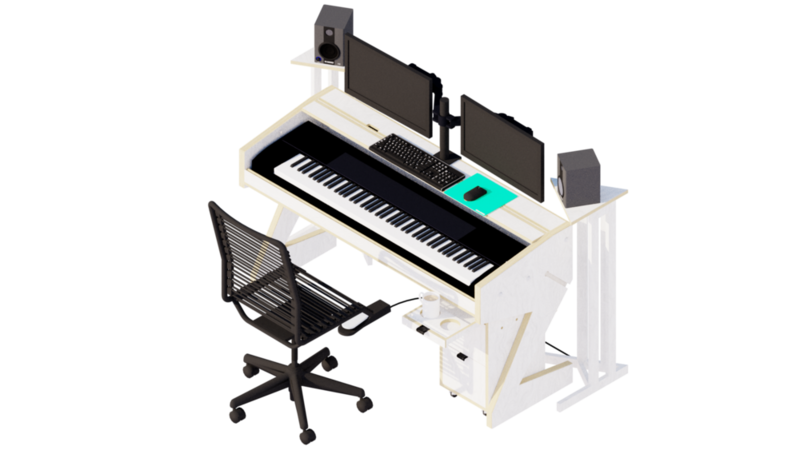 As currently I have not only my 25KG MIDI keyboard sat on it, but also my heavy monitor mount and 2 monitors attached to the (unsupported) middle back, it's started to bend over the year! The front is absolutely fine because it already has the front glued onto it, so the brace should sort this out nicely. 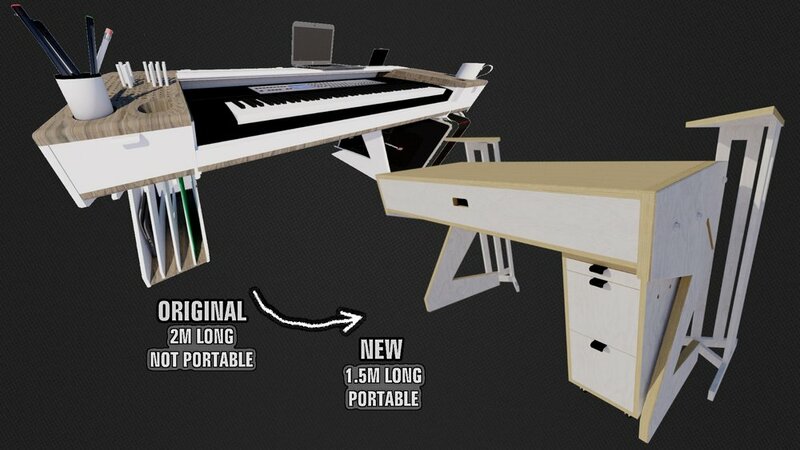 Anyway, the final change here is that the desk top/keyboard lid will be made out of two pieces, not three. There's no need to hinge the top into two anymore, since it doesn't need to bend to slide down into the legs, it just sits between them. The legs (1) are bolted onto the rear storage (3) one end at a time. Don't tighten yet. Now the keyboard tray (2) can be lowered into place, on top of the legs, and bolts passed through and tightened. 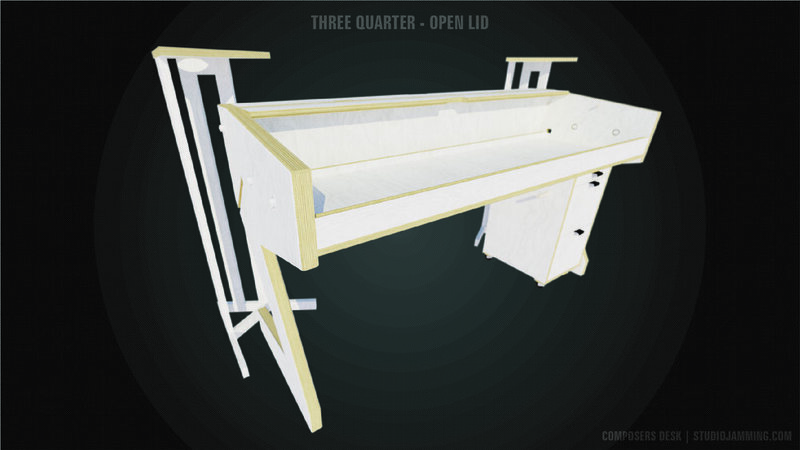 Tighten the rear storage bolts, and then the desk top can be carefully lowered into place. 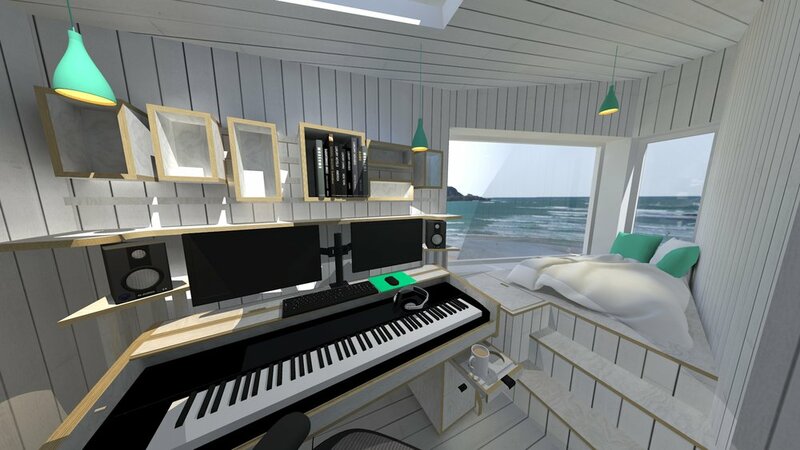 And here's the finished desk sitting in one of my many office designs. Oh what I'd do for a view like that! So that about concludes this blog entry! I can't say exactly when construction on the desk will resume, but hopefully sooner rather than later. I haven't had a desk for years! Don't forget, if you have any comments or questions, please leave them down below. Alternatively you can email me via the icon at the top and bottom of every page. 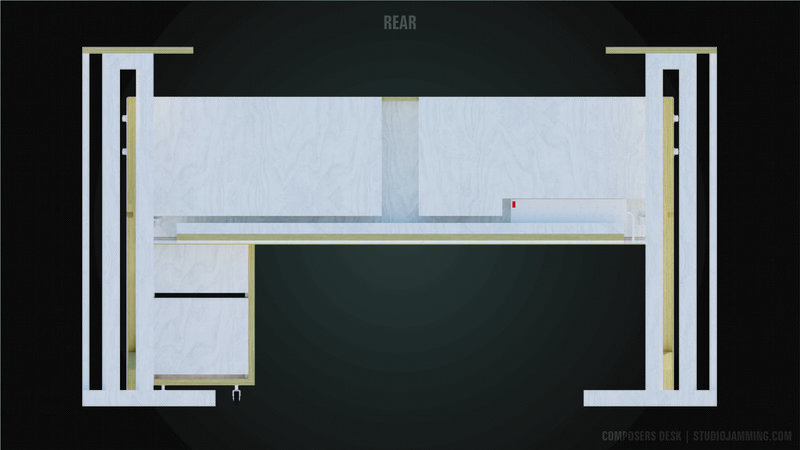 If you have an idea for a tiny architectural space, or even a bit of furniture, I welcome any suggestions! Pull handles - Jamie R.
Office chair - Chris W.
Sustain pedal - Mark D.
Mug of tea - Eddie B.